This past weekend, the documentary as a tool for change was discussed at “Envision: Addressing Global Issues Through Documentary,” a forum co-sponsored by the IFP in partnership with the United Nations Department of Public Information. 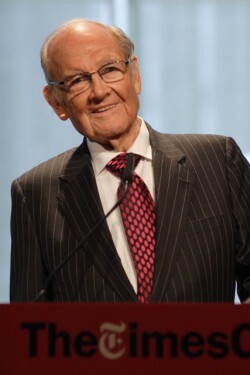 During his keynote speech, the legendary activist and singer, Harry Belafonte cited media as one of the most powerful tools in the activist arsenal, noting that just this Spring, “little devices have connected people without apparent ideology other than a thirst for freedom, enabling people to rebel against repression.” Belafonte announced HBO as a new partner for Envision and introduced Sheila Nevins, the head of documentary programming for the channel. Nevins presented that night’s film, The Sound of Mumbai: A Musical, a doc about a choir of children from the slums who were selected to perform at one of India’s most prestigious concert halls. Nevins praised the film’s message that “people can rise, but someone has to orchestrate it for them.” Capping the evening was a performance by the P.S. 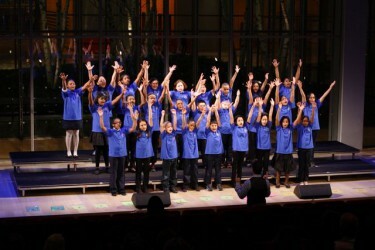 32 Chorus, whose rousing elementary school enthusiasm left few dry eyes. He reminded the audience, “in the age of fast, international travel, each one of us has a stake in preventing disease throughout the world.” It was a presentation that was as gonzo in its hope as it was convincing in its facts. Evans noted how little money it would take to change the world. (To learn more, check out the 4 Billion Reasons website here). The audience was then treated to a screening of The Boy Mir: Ten Years in Afghanistan. On the “Balancing Issues & Art in Documentary Storytelling” panel that took place after the film, the film’s director, Phil Grabsky, told the audience that he had chosen to follow a child growing up because “to get people in the cinemas, there has to be a narrative.” Matthew O’Neill, a Director and Producer at DCTV, agreed with Grabsky, stating that “an issue is never enough” to get an audience to watch a film. Afterwards, during a panel on Food Security, Bettina Luescher, Chief Spokesperson for the World Food Programme, noted that hunger wasn’t just a developing world problem because “a hungry man is an angry man…desperate men do desperate things. It’s a stability issue. It’s a safety issue.” The entire panel emphasized to the filmmakers in the crowd the importance of telling stories with a bit of hope in them. If ever there was a testament to power of a little aid, it’s Waste Land, Lucy Walker’s Academy-nominated documentary about artist Vik Muniz’s collaboration with the pickers of recyclable materials that work at the world’s largest dump, that screened after the panel. For the filmmakers in the audience, the entire event was a stirring rallying call, a reminder that causing change can be as easy as hitting a record button. Top Photo: Sheila Nevins, Harry Belafonte and Joana Vicente. All photos by Phil Stearns.